The right usage of Grey Card is not known in details specially who are new to DSLR Photography or uses Point and Shoot or Mobile Camera. Previously we talked about the Zone System in Photography – where we have seen a theoretical construction of 11 (zone 0 to zone 10) Zones by densitometry accurately in calibrated gray values; from full black to full white. White balance is an important aspect for natural looking Photos. We talked about How To Get The Correct Colors With On Camera White Balance Settings. Setting a custom white balance can be quite painful, especially if the photographer is new to digital photography or is using not very high end camera. Using measured neutral gray card is a well and long known Gold Standard method to get the right white balance. It is not that, only Color Photography demands setting the White Balance rightly, as we said before; Black and White Photography is actually more sensitive to very small changes in any of the basic aspects as we do not look the world as a colorless grey scale world. A gray card is used in photography for calibration of the exposure. A grey card actually is usually a strong cardboard or a card made of plastic , which on the one side, has neutral gray and the reverse side has white color. The gray side reflects about 18 percent of the incident light and about 90 percent on the white side. Best example is the Kodak R-27 set, which contains two 8×10″ cards and one 4×5″ card. Nearly all light meter are calibrated to provide settings that apply to a scene with average brightness distribution. From the brightness distribution in a design always an integral value is determined. 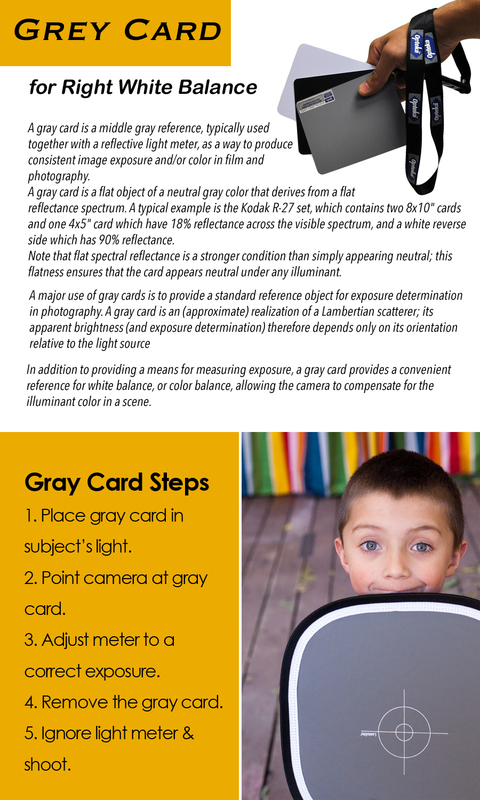 In digital photography, the gray card can also used to calibrate the white balance are when the gray card is coated with a metamerism-free color. Every lighting situation taken with a gray card may very well refinished with manual white balance. The image processing software works as a reference for determining the color temperature of the light. This Article Has Been Shared 7286 Times! Cite this article as: Abhishek Ghosh, "Grey Card for Right White Balance," in The Customize Windows, April 19, 2014, April 21, 2019, https://thecustomizewindows.com/2014/04/grey-card-right-white-balance/.